There are two types of Wai Dan exercise, moving and still. In moving Wai Dan, a specific muscle or part of the body is repeatedly tensed and relaxed as you concentrate on that muscle. 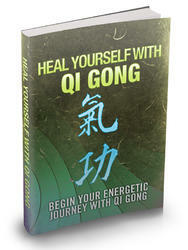 Use as little tension as possible because great tension will constrict the Qi channels and prevent the flow of energy. Some practitioners do not tense their muscles at all, but merely imagine tensing them. Others tense them just enough to aid concentration. When you exercise a part of the body in this way for several minutes, the Qi accumulates in that area, which usually results in a local feeling of warmth. Both energy and blood are collected in this high potential area. When the muscles relax, the highly charged Qi and blood will spread to nearby areas with a lower energy state and so inrreAse the Oi circulation. According to acupuncture theory, the Qi channels are connected to the interned organs. If Qi is circulating smoothly, then the organs will function normally. If an organ is not functioning normally, then increasing the Qi flow in the corresponding channel will help to restore its normal function. In moving Wai Dan exercises, the mind concentrates on the breath and at the same time imagines guiding energy to a specific area. As was mentioned earlier, the Qi channel system and the brain are closely related, so that when you concentrate, you can control the circulation of Qi more efficiently. This in turn results in the muscles being able to exert maximum power. This is what is known as Wai Dan internal power. For example, in order to guide the Qi you have generated to the center of your palm, imagine an obstacle in front of your palm and try to push it away without tensing any muscles. The better you imagine, the stronger the Qi flow will be. Frequently, when an object seems too heavy to move, and you have tried in vain to push it, if you relax, calm down, and imagine pushing the object, you will find the object will now move. Therefore, in practicing the moving Wai Dan exercises, you should be calm, relaxed and natural. The muscles should never be strongly tensed, because this tension will narrow the Qi channels. Concentrate on breathing with the Dan Tian (Elixir Field, ft ® ) and on guiding the Qi. There is a disadvantage to Wai Dan moving exercises. Because of the repeated tensing and relaxing of the muscles during training, the muscle itself will be built up, as in weight lifting, and can become overdeveloped. This over development will slow you down, and at the same time will constrict the channels. When these overdeveloped muscles are not regularly exercised, they accumulate fat, which will further narrow the channels, and the Qi and blood will become stagnant. Common symptoms of this phenomenon are high blood pressure, local nerve pain, and poor muscle control. In the Chinese martial arts this is called San Gong or Energy Dispersion. As long as you avoid overdeveloping your muscles, San Gong will not happen. In still Wai Dan, specific muscle groups are also stressed, but they are not tensed. For example, in one type of still Wai Dan practice you extend both arms level in front of your body and hold the posture. After several minutes the nerves in the arms and shoulder areas become excited, and reach a higher energy state. When you drop your arms and relax, the generated Qi will circulate to areas of lower potential, much like an electric battery circulates electricity when a circuit is made. In still Wai Dan, there is no danger of over development because the muscle is not being exercised as it is in moving Wai Dan, so consequently there is no risk of San Gong. Although the muscle is not built up in still Wai Dan training, its endurance is increased. If you practice Wai Dan and also have training in Nei Dan (internal elixir, ^ #), you can accumulate Qi in the Dan Tian with breathing and concentration, and guide this energy to the area being stressed to enhance the Qi circulation. In this case the method is a mixture of Wai Dan and Nei Dan. This kind of training is commonly used in the practice of Taijiquan. What is 49 meridian chi gong? How to accumulate the electric energy in the dan tien? How to do waidan standing meditation? What is the diffrence between qi gogn and wai dan gong? Is wai dan gogn a part of qi gong?